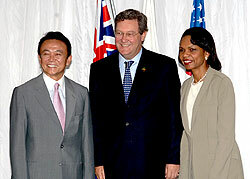 The Foreign Minister of Australia, Mr Alexander Downer, the Foreign Minister of Japan, Mr Taro Aso and the Secretary of State of the United States, Dr Condoleezza Rice met in Sydney, Australia, on 18 March 2006 for the inaugural ministerial meeting of the Trilateral Strategic Dialogue between the three nations. As longstanding democracies and developed economies, our three countries have a common cause in working to maintain stability and security globally with a particular focus on the Asia Pacific region. This meeting was a significant step in intensifying the strategic dialogue between our countries and reflects the importance we attach to greater trilateral cooperation in addressing contemporary security issues. This cooperation will complement the strong security relationships that each of our three countries has established. Discussions during the dialogue covered a wide range of current security challenges, both regional and global, of shared interest to our three Governments. Supporting the emergence and consolidation of democracies and strengthening cooperative frameworks in the Asia-Pacific region was a particular focus of our attention. We welcomed China's constructive engagement in the region and concurred on the value of enhanced cooperation with other parties such as ASEAN and the Republic of Korea. We recognised the importance of reinforcing our global partnership with India and noted that India's decision to place its civilian nuclear facilities and programs under international safeguards would be a positive step towards expansion of the reach of the international non-proliferation regime. We discussed the current situation in North Korea and called on it to return immediately and unconditionally to the Six-Party Talks with a view to implementing the Joint Statement of the Fourth Round of the Six-Party Talks. We looked forward to the ASEAN visit to Burma/Myanmar and underscored the need for genuine progress in democratization there, including the release of all political prisoners. We have grave concerns about Iran's nuclear program, and discussed the need for concerted action at the UN Security Council to convince Iran to promptly suspend all enrichment-related activities, fully cooperate with the IAEA, return to negotiations and take all steps called for by the IAEA board. We are also mindful of the challenges facing Pacific island countries and are determined to work together to support economic development and good governance. To strengthen trilateral cooperation, we decided to enhance our exchange of information and strategic assessments on major international and regional security issues and developments, including to assist our efforts to counter terrorism and the proliferation of weapons of mass destruction. We also reaffirmed the value of conducting regular trilateral consultations between our respective Ambassadors in charge of Counter-terrorism, with the intention of supplementing and reinforcing the network of partnerships each of our countries has created to fight the global terrorist threat. Our agenda also encompassed pressing non-traditional security issues, such as the response to major pandemics, which is another area in which each of our three countries is committed to building on the already significant contribution we have made to regional security. In recognition of the importance of strengthening international institutions that contribute to the maintenance of security, we reaffirmed the need to continue efforts to reform the United Nations, including the Security Council, and the support of our three Governments for Japan's bid for a permanent seat on the Security Council. The trilateral dialogue between the United States, Japan and Australia began at the level of senior officials, in 2002. Its elevation to the level of Foreign Ministers reflects our determination to work together to protect our shared strategic interests in promoting peace and stability in the Asia-Pacific region. We expect that the dialogue will be held regularly at the Ministerial level, augmented by regular meetings of senior officials throughout the year.